Posted on Mon, Jan 16, 2012 : 5:57 a.m. The dance company Step Afrika! will perform at the Lydia Mendelssohn Theatre on Thursday, Jan. 19 at 7:30 p.m. as part of the University of Michigan’s 25th annual MLK Symposium. Admission is free. Step Afrika! is the first professional company in the world dedicated to the tradition of stepping, where the body is used as an instrument to create intricate rhythms and sounds through a combination of footsteps, claps, and spoken word. The tradition grew out of the song and dance rituals practiced by historically African American fraternities and sororities in the early 1900s. Stepping comes from a long and rich tradition in African-based communities that use movement, words, and sounds to communicate allegiance to a group. Based in Washington, DC, Step Afrika! has been featured on CNN, BET, PBS and NPR as well as in numerous books, documentaries and articles that explore the tradition of stepping. The company is critically-acclaimed for its efforts to promote an understanding of and appreciation for stepping and the dance tradition's use as an educational tool for young people worldwide. Step Afrika! appears by arrangement with MCM Arts and Entertainment. This performance is sponsored by the University Library, the Law Library, the Bentley Historical Library, the School of Music, the School of Information, the University Housing Department, and the Office of Academic Multicultural Initiatives. 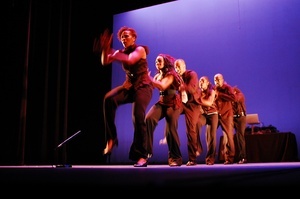 For more information about Step Afrika, please see http://www.stepafrika.org/home.htm.